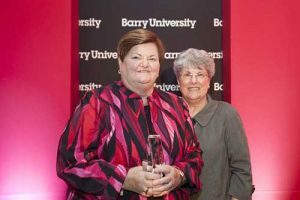 February 24, 2017, Miami Shores, Florida – Two Adrian Dominican Sisters – Peg Albert, OP, PhD, and Nancy Murray, OP – were among 10 to be honored as Distinguished Alumni of Barry University. The February 9 award luncheon, held at the Coral Gables Country Club, launched Barry’s Reunion Weekend. 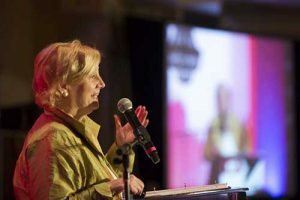 Sister Peg, President for the past 10 years of Siena Heights University in Adrian, studied for two years at Barry before entering the Adrian Dominican Congregation, then completed her bachelor’s degree in sociology at Wayne State University in Detroit. She earned both her master’s degree and her doctorate in social work at Barry, and completed post-doctoral work at the Institute for Educational Management at Harvard Graduate School of Education. 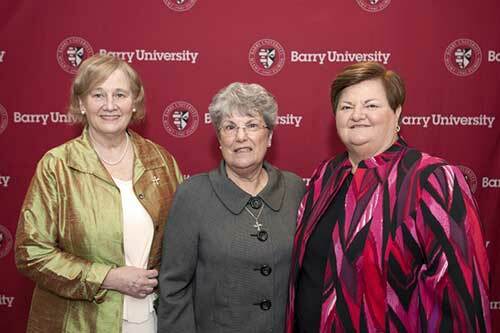 Sister Peg ministered for 23 years at Barry: as an associate professor of social work and a therapist for 12 years and as associate vice president for student services from 1988 to 1994, when she was named executive vice president. In 2001, she led Barry’s School of Law, helping it to earn accreditation with the American Bar Association. Sister Peg was named President of Siena Heights in 2006. Both Barry and Siena Heights Universities were founded and are sponsored by the Adrian Dominican Sisters. In an interview in Adrian, Sister Peg said her years as a student at Barry gave her the opportunity to meet people from different cultures, religions, and ethnic groups. In her work at Barry, she found “a real vibrant community – a community that cared for one another … and reached out beyond itself to care for others.” She has found a similar community at Siena Heights. Born in Wilmette, Illinois, Sister Nancy Murray graduated from Regina Dominican High School, also sponsored by the Adrian Dominican Sisters. She graduated from Barry with a bachelor’s degree in theatre and a minor in education, and went on to earn a master’s degree in pastoral studies from Loyola University, Chicago. Sister Nancy has taught at all grade levels, from elementary to university, and has served as campus minister and as the pastoral associate of an inner-city parish. Most recently, she has traveled throughout the world, on five continents, in her one-woman show portraying the life of the great Dominican mystic and Doctor of the Church, St. Catherine of Siena. Barry recognized Sister Nancy especially for work in spreading awareness of St. Catherine of Siena.